have run a benchmark on different data structures very recently at my company so I feel I need to drop a word. It is very complicated to benchmark something correctly. On the web we rarely find (if ever) a well engineered benchmark. Until today I only found benchmarks that were done the journalist way (pretty quickly and sweeping dozens of variables under the carpet). Most people running benchmarks are afraid of timer discrepancy, therefore they run their stuff thousands of times and take the whole time, they just are careful to take the same thousand of times for every operation, and then consider that comparable. The truth is, in real world it makes little sense, because your cache will not be warm, and your operation will likely be called just once. Therefore you need to benchmark using RDTSC, and time stuff calling them once only. Intel has made a paper describing how to use RDTSC (using a cpuid instruction to flush the pipeline, and calling it at least 3 times at the beginning of the program to stabilize it). u64 g_correctionFactor;  // number of clocks to offset after each measurment to remove the overhead of the measurer itself. __cpuid(a, 0x80000000);  // warmup cpuid. minDiff = Aska::Min(minDiff, tick2 - tick1);   // make many takes, take the smallest that ever come. This is a discrepancy measurer, and it will take the minimum of all measured values, to avoid to get a -10**18 (64 bits first negatives values) from time to time. Notice the use of intrinsics and not inline assembly. 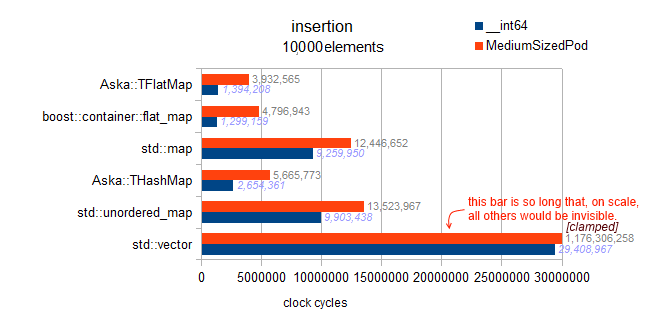 First inline assembly is rarely supported by compilers nowadays, but much worse of all, the compiler creates a full ordering barrier around inline assembly because it cannot static analyze the inside, so this is a problem to benchmark real world stuff, especially when calling stuff just once. So an intrinsic is suited here, because it doesn’t break the compiler free-re-ordering of instructions. cost of implementation of copy operation, assignment operation, move operation, construction operation, of the contained type. Point 2 is because some containers (say A) will loose time copying stuff around, and the bigger the type the bigger the overhead. The problem is that when comparing to another container B, A may win over B for small types, and loose for larger types. Point 3 is the same than point 2, except it multiplies the the cost by some weighting factor. Point 4 is a question of big O mixed with cache issues. Some bad complexities containers can largely outperform low complexity containers for small number of types (like map vs. vector, because their cache locality is good, but map fragments the memory). And then at some crossing point, they will lose, because the contained overall size starts to “leak” to main memory and cause cache misses, that plus the fact that the asymptoptic complexity can start to be felt. Point 5 is about compilers being able to ellude stuff that are empty or trivial at compile time. This can optimize greatly some operations, because the containers are template, therefore each type will have its own performance profile. Point 6 same as point 5, PODS can benefit from the fact that copy construction is just a memcpy, and some containers can have a specific implementation for these cases, using partial template specializations, or SFINAE to select algorithms according to traits of T.
Apparently the flat map is a sorted vector wrapper, like Loki AssocVector, but with some supplementary modernizations coming with C++11, exploiting move semantics to accelerate insert and delete of single elements. Have you considered that maybe you need a flat_unorderedmap ? which would be something like google::sparse_map or something like that. 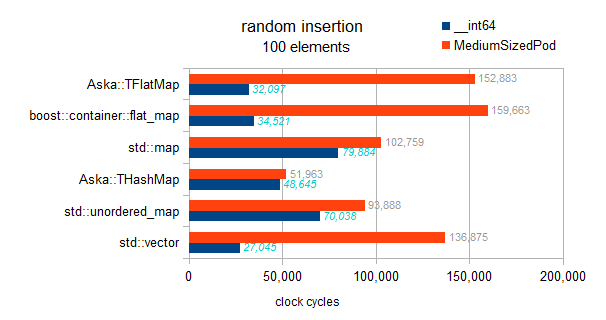 An open address hash map. The problem of open address hash maps, is that at the time of rehash they have to copy all around to the new extended flat land. 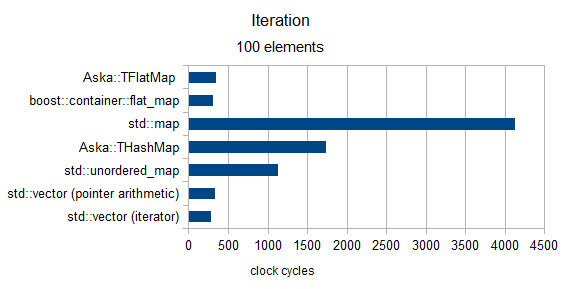 When a standard unordered map just have to recreate the hash index, but the allocated data stays where it is. The disadvantage of course is that the memory is fragmented like hell. The criterion of a rehash in an open address hash map is when the capacity overpasses the size of the bucket vector multiplied by the load factor. A typical load factor is 0.8 therefore, you need to care about that, if you can pre-size your hash map before filling it, always presize to: intended_filling * (1/0.8) + epsilon this will give you a guarantee of never having to spuriously rehash and recopy everything during filling. The advantage of closed address maps (std::unordered..) is that you don’t have to care about those parameters. But the boost flat_map is an ordered vector therefore it will always have a log(N) asymptoptic complexity, which is less good than the open address hash map (amortized constant time). You should consider that as well. This is a test involving different maps (with int key and __int64/somestruct as value) and std::vector. Ok, because my previous results included a bug, they actually tested ordered insertion, which exhibited a very fast behavior for the flat maps. I left those results thereunder because they are interesting. We can see that ordered insertion, results in back pushing, and is extremely fast. However, from non-charted results of my benchmark, I can also say that this is not near the optimiality of back-insertion in a vector. Which is 3Million cycles, we observe 4.8M here for boost (160% of the optimal).